Being wise is about so much more than knowing the right answer. Indeed, it can be argued that knowing the right answer can be an obstacle to learning and understanding. As we move further into times where knowledge is ubiquitous and yet truth is increasingly hard to find, merely knowing the right answer can be an impediment. It is often noted that young children ask lots of questions and are inherently curious. As they grow and some will say as they engage in formal learning the number of questions they ask declines. It is perhaps equally true that young children know lots of facts, good hard unequivocal facts. For many children, the number of facts of which they appear to be certain of also declines but this is not the case for all. Some children seem to cling to their habit of collecting facts as though they hope one day to be champions at trivial pursuit. One of the great joys of my week at present is working with small groups of children on individualised units of inquiry. The children started the process with wondering about topics they are interested in and from that posing questions they wish to explore. Much of the initial process for some of the learners pivoted around their sharing of the things they knew about obscure topics. If you want to have an interesting conversation, ask a ten-year-old what they “know” about matter. Very quickly you are likely to find yourself in a laundry list of facts about dark-matter, anti-matter, black-holes and maybe even light-holes (a new one for me). The conversation gets more interesting when you begin to explore where this knowledge came from. Reliable sources of information seem to include ‘friends who told me’, TV shows, some website and a never-ending stream of images sourced from the internet that reveal amazing photoshop skill but little connection with real physics. It is enlightening to observe the manner in which untrained students engage in internet based research. Many seem to believe that being physically close to information is sufficient. Having conducted a search, they often find a page that is full of useful information. In many cases the site might be from a reliable source and back its claims with evidence and data. Sadly, too many students either skim over site like these without giving the time required to develop a deep understanding of the arguments presented, or they quickly abandon this site for one with a catchy headline and more images. Our students need to move beyond possessing the capacity to read research to a disposition for reading such resources. In a dispositional model students, would be able to read the site and make sense of the information it offers, would value a deep analysis of the information they find and recognise the importance of this style of deep, analytical reading. Some of the students manage to avoid the desire to speak in such ‘factoids’. Instead they ask deep and challenging questions and you can see them struggling to make sense of the information in front of them. They approach ‘knowledge' the way one might approach an unknown dog; cautiously, one hand extended as an act of faith, the body posed to retreat at the first sign of trouble. These are the deep thinkers that I most enjoy chatting with; they are the ones who have discovered the value of a healthy dose of scepticism. Believing that we already ‘know’ the answer is more than a barrier to inquiry. It stands in the way of us asking questions and we only value the right answer it prevents us seeking a deeper understanding. If I value knowledge because it allows me to provide the right answer on demand or on the test, I will not desire understanding. A culture of testing and rewarding students who are most able to rapidly offer the right answer has led us to adopting pedagogies most suitable for rote learning. When knowledge was hard to find these methods may have had value, but now, when knowledge is easy to find but hard to trust such methods are failing our students. When we are overly confident in what we know, we are unlikely to question its truth. If being able to recall facts is sufficient, we are prone to spending our time gathering many disjointed pieces of information without taking the time to seek evidence of their validity or making connections between them. We will accept the fake news, trust in sources which appear most convincing or that connect with our pre-existent beliefs and be fodder for those who wish to blind us from the truth. Our desire to have simple answers, neat chunks of knowledge has led us to turn away from reason, evidence and explanations that reveal layers of complexity and gaps in our knowledge. The innovations described in ‘Not Invented Here’ become possible when organisations deliberately look for new answers and solutions that lie outside of ‘the way things are done here’. The authors detail a process of strategic questioning that allows insights to be found not just outside of the box, but in the boxes and backyards of other industries. One useful strategy is to ask “What would X do here?”, not once but with multiple organisations inserted in the place of X. A school for example might ask “What would an airline do here?” or ‘What would IBM do in this situation?”. It is easy to assign blame for our ready acceptance of facts, our failure to ask questions or to dig beneath the surface of our knowledge. It is easy to blame the students or maybe the internet or perhaps social media and politicians. The truth is more complex. It is the manner in which we measure knowledge and assess learning. Our culture of testing and grading that allows students to achieve success in school with only shallow knowledge. It is our lack of time and haste in all that we do that prevents us from engaging in deeper inquiry. In our work places we appreciate quick and easy solutions yet ignore the perilous road that this places us on as startups erode our market share with entirely new approaches; we risk becoming the next Kodak or BlockBuster rather than rocking the boat. The blame game is easy, but of little value. The solution will require new approaches. Our students need to see that we value questions more than answers; understanding more than knowledge. We need to constantly ask ‘What makes you say that?’ and require that our students argue with reason and logic. Quick answers need to be replaced with long discussion and healthy debate. Strategies which encourage us to analyse information deeply and truly understand the challenges we face before proffering solutions need to be deployed. We need to be sceptics and yet have minds that are open to new possibilities when confronted by evidence that undermines our assumptions and previously valued beliefs. For our children, schools need to provide a culture that requires them to think and that has deep understanding as its goal. To do anything less is to undermine their future and condemn us to endlessly reliving our past. 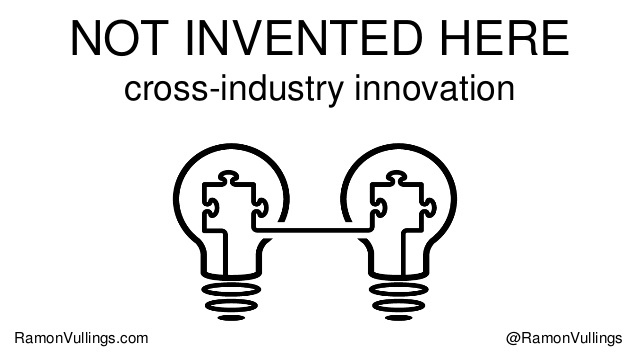 Vullings, R. & Heleven, M. (2015) Not Invented Here: Cross-Industry Innovation. BookBaby. Kindle Edition.